DEAR JERRY: In New York in the late 1960s, for a while anyway, the Top 40 stations played a song about Friday being payday. It might have a title with similar wording. It was a male singer with a doo-wop style vocal backing. The two most common answers I get when asking about this are "Blue Monday" (with "on Friday I get my pay") and "Thank God It's Friday." Neither is correct. What say you, Mr. Music? DEAR EMORY: Friday is indeed payday for the fellow in the song ("I'm not sweatin' Monday 'cause my fun day starts right now"), but the full title is just one word: "Payday." The reason "Payday," a 1970 single (Kama Sutra 507), has a doo-wop feel to it is because it is by Sha Na Na, a 1950s tribute group that was especially popular in the tri-state area. DEAR JERRY: Just for laughs I put my first name into a song search, and up popped something called "Cora's Melody." But when I went to YouTube to look for it, all I found was someone playing something on their piano at home. Now I'm left wondering if there really is a "Cora's Melody." —Cora Houseman, Traverse City, Mich.
DEAR CORA: There really is a legit record of your melody, and it was a regional Top 40 hit in late 1960 for Bob Thompson and His Orchestra (RCA Victor 47-7795). In Los Angeles, KRLA radio chose "Cora's Melody" as their Pick to Click for October 21-28. That means they rated this beautiful instrumental as the best new record that week. DEAR JERRY: My mother, now in her 80s, told me about her and my father being friends with a family in Cincinnati named Greer. That was in the 1950s. She recalls they had two daughters who sang on local radio and TV, and called themselves the Greer Sisters. Knowing I have the Internet, she asked me to do some searching and see if they ever made a name for themselves. Problem is, the only Greer sisters I can find (Robin and Liza) are authors who weren't even alive until the '70s. I give up. You are my last resort. —Keitha M. Fillmore, Anderson, Ind. DEAR KEITHA: I applaud your effort to get the information on your own, but your search was doomed from the start, because of just one letter. 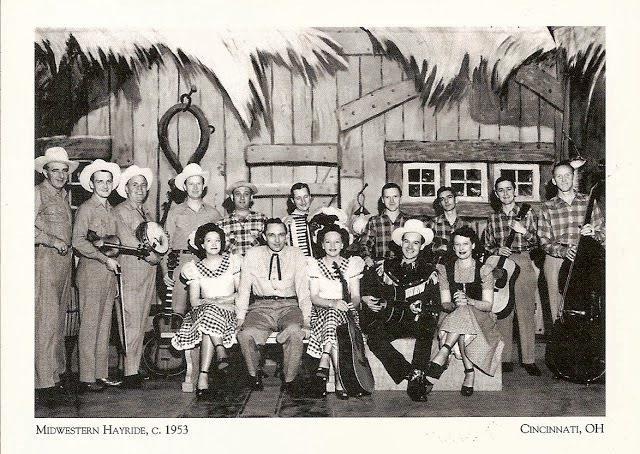 The Ohio family with the singing sisters is named Geer, not Greer. Mary Louise Geer and Jo Ann Geer appeared on radio and TV in the Queen City, and elsewhere in southern Ohio, but are best remembered for their appearances on the weekly Midwestern Hayride (1951-1959) on WLW-TV. In 1954, the Geer Sisters were signed by RCA Victor, resulting on two singles on their subsidiary 'X' label. Those four tracks are "Unloved and Unclaimed" backed with "Menu Love" ('X' 0079), and "Shanghaied" with "Today I Picked Roses" on the reverse ('X' 0115). Both records came out on 45s and 78s in 1955, unfortunately, at least for them, a time when their throwback hillbilly style couldn't compete with traditional country artists (Ray Price; Marty Robbins; Webb Pierce; Hank Snow; Eddy Arnold; Johnny Cash; Hank Thompson; Lefty Frizzell; etc., etc. ), and had even less of a chance against the juggernaut known as rock and roll. IZ ZAT SO? Nearly every summer in the '50s, the television audience for the Midwestern Hayride proliferated from regional to national. 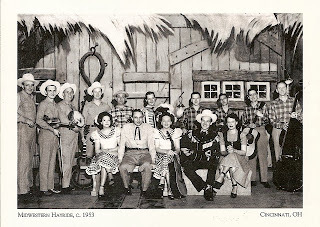 The Hayride was a popular vacation replacement show, resulting on a weekly prime time slot for three or four months every year, except 1953. For six years they were carried by NBC (1951-1956, and 1959) and two years by ABC (1957-1958).